"I only make movies about real superheroes." Warner Bros. Animation's big screen adaptation of the long-running Teen Titans Go! children's animated series on Cartoon Network is just as silly and self-referentially fun as you would expect. Teen Titans Go! To the Movies, based on the popular DC Comics team of sidekicks, uses our current age of more sophisticated superhero films to send up some of the more serious elements of their live action counterparts. 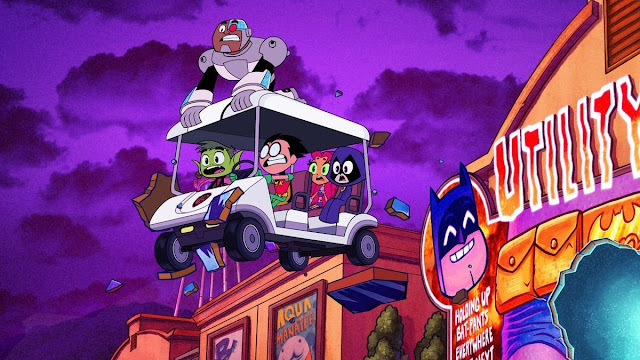 The show's voice cast of Scott Menville, Greg Cipes, Khary Payton, Tara Strong, and Hynden Walch all return as Robin, Beast Boy, Cyborg, Raven, and Starfire to dissect our cultural obsession with comic book movie fare as the Titans are desperate for their own film adaptation. It's all very meta. Enter Will Arnett (also a producer) and his goofily charming and deep throated vocal skills as Slade—a more kid-friendly version of the supervillain Deathstroke—and his inclusion makes sense so much of the humour feel like a PG version of both Deadpool films of which said character was originally a parody of. With additional voices from Kristen Bell as a big Hollywood movie director and Nicolas Cage as a more comical version of Superman, the plethora of sometimes juvenile jokes involve many clever uses of the characters and cast to mine enough reverent broad comedy while mocking their own genre of entertainment in fun ways. Written by Teen Titans Go! creators Aaron Horvath and Michael Jelenic with Horvath co-directing alongside series producer Peter Rida Michail, the team on and off-screen have firmly made a lighthearted kids movie with just enough material to appeal to adults both celebrating and skewering all things superhero related.